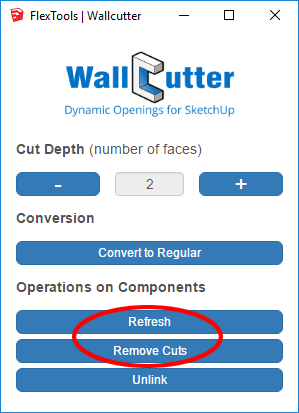 Cut dynamic openings through multiple layered walls with any window/door component instantly! Automatically create openings in walls that adjust to your window or door’s position and scaling. Cut openings through multi layered walls. Set the number of faces to cut through. Full compatibility with Sketchup 2018's section fills. The dynamic openings are made of fully editable geometry. The wall remains a solid. The opening geometry inherits the wall's materials, with correct mapping. Wall cutting works independent of components hierarchy structure. You can place windows and doors outside of the wall component. WallCutter components are controlled by the WallCutter Control Panel and influenced by the Place Upright toggle. Set the number of faces to cut through (Default = 2). When saving a component, it's 'cut depth' is saved along with it. You can also use the Refresh Tool from the toolbar, but remember that it also refreshe's DCs (can take time). Disconnect components from the openings they created. If you move or delete the components after unlinking, the openings remains static and unchanged. Mark sub-components to be excluded from the WallCutter algorithm so they will not affect the opening being cut. Good for situations of window trim, sill horns etc. B. (ON) Inserting a component rotated by 90 degrees so it is upright, not glued to any surfaces, and it won't cut openings automatically. 📌 Having this toggle ON is a time saver. It is good for situations when you want to insert a Flex component immediately into an already existing opening in a wall (without needing to rotate the component and then to convert it into a Regular Component). 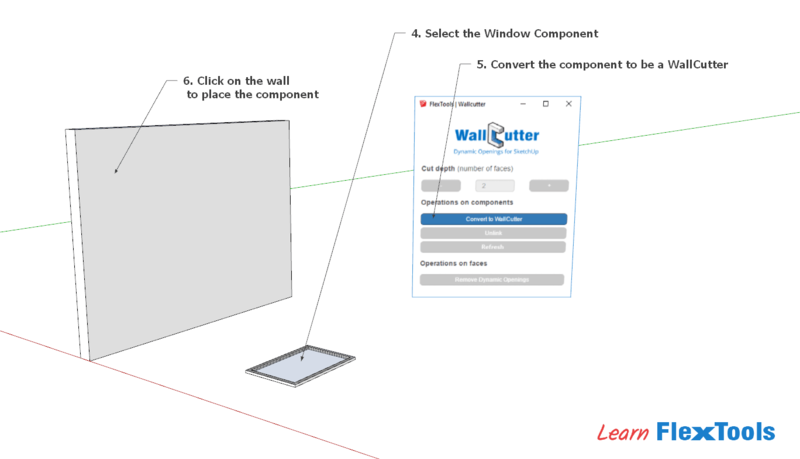 This tutorial will walk you through the basic functions and workflow of WallCutter right inside Sketchup. It requires that you have FlexTools and WallCutter installed. A WallCutter component 'glues' to a wall at it's Axes Point XYZ. 1. Set the XY plane (Red & Green axes) to be parallel with the wall's surface. 2. Set the Z axis (Blue) to be perpendicular to the wall's surface. 3. Click on Convert to WallCutter and place it on a wall component. 📌 The wall's faces (normals) must be pointing OUT (In 'monochrome view' the faces would be white on the outside and colored on the inside). The window's Z axis (Blue) is perpendicular to the wall's surface. 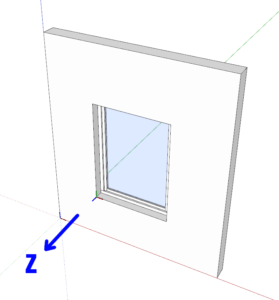 Setting a window's position in relation to the surface of a wall along the Z axis (Blue). Setting a Flex component's position in relation to the surface of a wall with the 'Inset' setting. Copying / Mirroring / Exploding / Making Unique / Changing a Walls thickness are operations that can cause WallCutter components to 'not work' as expected or to 'break', meaning that their openings may stop being dynamic, or that some unexpected wall geometry may get deleted. Before making changes like mentioned above, first remove the dynamic openings by clicking on Remove Cuts. Then Make the Changes you need. After the changes are done, restore the dynamic openings by clicking on Refresh . Let's see a few examples below. 1. Copy Wall and Window Components to a new location. 4. Select All Windows > Refresh -> DONE! All openings are restored and dynamic. 📌 If you want the copies to stay the same, simply make a new component out of them and copy it around the model. If you want to make one of the new components unique, see below. 1. Make copies of the containing component. 2. Select any copy > Remove Cuts -> All openings are removed. 3. Select a copy to make unique > Right Click > 'Make Unique'. 4. Double click into the component > Select the wall > Right Click > 'Make Unique'. 5. Select all components > Refresh -> All openings are restored and dynamic. 1. Select the WallCutter components. > Remove Cuts -> All openings are removed. 2. 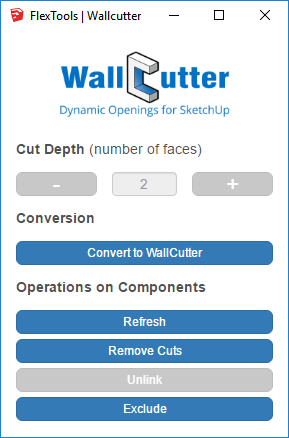 Copy the Walls and WallCutters with CTRL+C. 3. Switch to the new model > CTRL+V or 'Paste in Place'. 4. Select all components and walls > Refresh -> All openings are restored and dynamic. 1. Select the containing component > Remove Cuts -> All openings are removed. 2. Explode the containing component > Right Click > 'Explode'. 3. Select all the window components > Refresh -> Openings are restored and dynamic. 1. Select the window components > Remove Cuts -> All openings are removed. 2. Double Click into the wall component > Change the wall thickness. A wall's faces (normals) must be pointing OUT - In 'monochrome view' the faces would be 'light' on the outside and 'dark' on the inside. WallCutter does not work well with Groups. Don't use them! Use Components! Scaling multiple WallCutter components may cause them to un-glue. Mirroring WallCutter components may cause the the mirrored components to become un-glued and the openings will not be generated immediately. Refresh the components and the openings will regenerate. Wall components do not have to be solids. If they are, WallCutter maintains their solidity. It is highly recommended to work with 'clean' walls - remove any unneeded stray lines before applying wall-cutting components onto them. WallCutter currently works with Convex Hulls only. WallCutter cuts through planar faces only - It does not cut through curved or fragmented surfaces. It does not cut if there are lines on the wall where the component is supposed to be placed. Saving Components with WallCutters inside them with ComponentFinder or with Right Click > Save As, causes the dynamic openings to stop functioning when pulled into a new model.